You are listening to RAM-FM, music to rant and rave to. Anorak has long imaged that trad-jaz was the music of lost causes but it turns out to be soft rock. RAM-FM had been broadcasting English-language talk shows and artists like Michael Bolton and Air Supply from a studio in the town of Ramallah since last year. 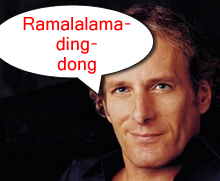 Anorak imagines that if anything were designed to engender feelings among Israelis and Palestinians that Ramallah should be blown to smithereens it would be Michael Bolton. In that they can be united. Conspiracy theorists can wrestle with the fact that RAM-FM was the brainchild of South African Jewish businessman Issy Kirsh.